One of the most important aspects of building a new home is choosing the right heating and air conditioning unit. If the right unit is selected, it can make a dramatic impact on your overall heating and air bill during the life of your home. In addition, you want to find a unit that will evenly heat and cool the home so the entire home is comfortable from one end to the other. A high efficiency furnace is critical when it comes to picking the right unit to heat your home. Selecting a unit that offers at least 90% efficient is critical. Many builders opt for a cheaper heating unit that is less than 90% efficient to cut corners. However, this can negatively affect your home and heating bills for years to come. A good builder will choose a 92% to 95% efficient furnace to give you the highest quality of furnace possible. How do you know if you have a high efficiency furnace? The PVC pipe will be sealed to prevent air leakage. This lends to the unit being as efficient as possible. In addition, the return on the furnace should have properly taped seams. Without this important step, cool or warm air will escape and decrease the efficiency of the appliance. Where Should the Furnace Be in My Home? The furnace should also be strategically placed in the middle of the home. This prevents the unit from being forced to push air from one end of the house to the other. By having it in the middle, the air can be distributed evenly and not put undue stress on the appliance. If you have a two story house, you have two options of how to ensure the heat and air are evenly distributed to your home. One choice is to put a complete unit on each floor. This will make sure each floor is properly heated. Another option is to use an electronic damper system. This will put a thermostat in several rooms. Each thermostat will open or close vents in your furnace. This allows you to generate more heat or cold to whatever area of the home you choose. 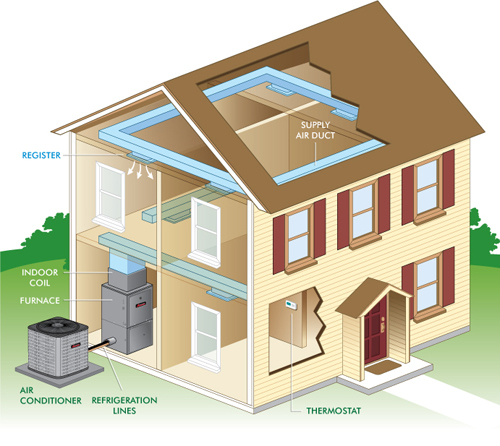 A high efficiency heating and air unit is crucial to finding the right unit for your home. By selecting the right unit and strategically placing it in your home, you are well on your way to having an evenly warm or cool home with as minimal cost as possible.